The vintage of 2007 was warm for Margaret River and excellent for red wines. The Cabernet fruit from Were Estate expressed ripe, intense fruit characters. The fruit was crushed, destemmed and fermented. Once fermentation was complete the wine was macerated on skins to extract maximum colour and flavour. The wine was matured in a combination of new and 1-2 year old French oak hogsheads for 18 months. Highly perfumed - cassis, vanillan and floral characters. Silky smooth with good length. A generous palate of dark fruits and dusty tannins. Persistent length. Drinking well now but will cellar for 6 - 8 years. 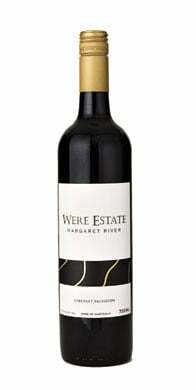 2007 was a great year for red wines produced in the Margaret River region, particularly the northern end where we are. Why don't you find out what all the fuss is about by trying one of our fantastic 07 reds!